Till a few years back eating outside was considered the cool thing to do. However according to the Godrej Food Trends Report 2018 this is changing and changing fast. According to the report maximum people today prefer eating at home rather than outside. Another interesting thing to note here is even cooking is considered cool today. I always found it very weird when people said they found cooking boring or cooking was directly associated with anti feminism. 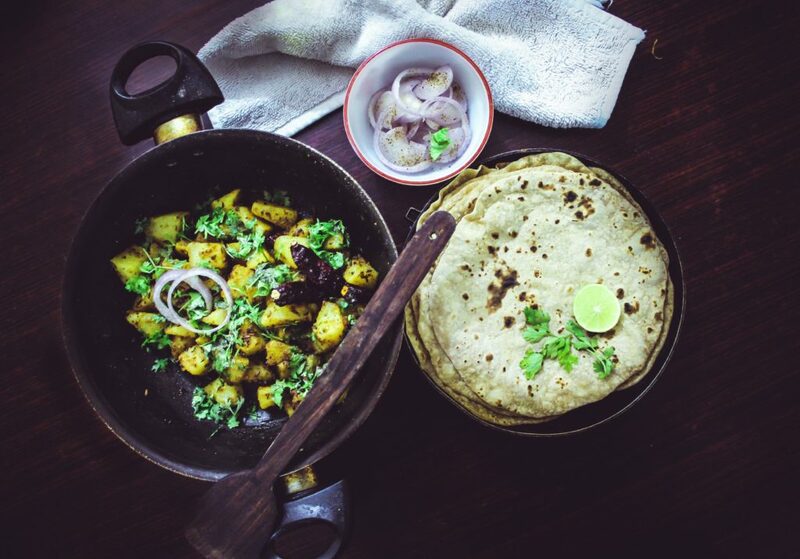 For me cooking is a life skill which you need not master but you need to know enough to survive. I tried inculcating this habit of helping out in the kitchen as a normal regular chore that both my children have to do. There was a time when there was a romance associated with going to the restaurant, however in later years it was more of a matter of convenience. I remember as a kid going to a restaurant was a big deal. We dressed up for the occasion and restaurants visits usually meant they were something important to celebrate. In the later years being going to restaurants meant catching up with friends or office colleagues. But such regular visit usually brought about some kind of health concern. As a newly wed we still did frequent the restaurants, however there was a drastic dip in eating out after the children. It was not only about health concerns but also a matter of convenience as not every restaurant would be equipped with baby food, plus managing the sleep schedules of the children in a nuclear family was tough with frequent outings. An interesting fact that I read in the Godrej home food Trends was that cooking at home to eat more mindfully was something that maximum people considered important. 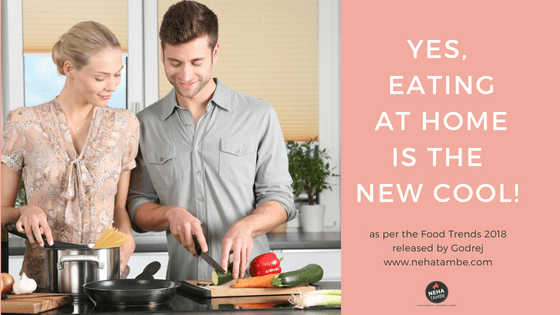 Other interesting reasons for cooking and eating at home according to the report were 1 food hygiene and safety concerns and to learning to cook new cuisines and dishes at home. At our house we usually shop together for the vegetables or other cooking needs. I realized how frequently I look for the ingredients on the labels or where the vegetables are coming from before buying; this is especially true after the children were born, however that also means that we are being more mindful about where the food is coming from. Eating out was more of a matter of convenience as the whole preparation that went into cooking was avoided and if both the husband and wife were working it was really unfair to expect someone to come home in the evening and then cook. Today there are a lot of options available like ready to make salads, home delivered cut vegetables, meal boxes that came in with the recipe as well as the ingredients required. All this has added a fun aspect to cooking. This summer vacation I enrolled my daughter for a crash course in baking and we also got hold of meal boxes with Italian cooking. My daughter thoroughly enjoyed making cupcakes and icing. She was also proud when she presented her pasta that she had made using the mealbox. Doing such activities not only inculcated a love for cooking or understanding the science of cooking but it also made her more aware about the ingredients, the various ways of cooking and sourcing products. I also realized that she has become more mindful about eating and not wasting her food. Not long ago the questions were only decked up with gas cylinders and stoves. This meant cooking was a hazardous activity for children and there was a need for constant vigilance. Today our kitchens are decked up with comparatively safe and interesting gadgets that help make cooking more fun. Gadgets like rice cooker or air fryers, ovens etc. have gone a long way in helping my daughter understand some new ideas and ways of cooking while me not worrying about the hazards involved in it. These gadgets have also helped make children more involved in the whole cooking process thereby making cooking a family activity rather than something where the woman of the house slogs the whole day. After reading the report I am encouraged to make cooking more of a family activity rather than just something that is done to feed ourselves. Learning through practical ways usually goes a long way rather than reading something. As moms how do you plan to bring about awareness and mindfulness in your children regarding food? What are your ideas to encourage them to understand how the science of food works? I would love to know your ideas around importance of food, non wastage of food and mindful eating? This post is a part of the Godrej Food Trends Blogging contest hosted by FashionableFoodz in association with Vichroli Cucina and should not be repurposed, republished or used otherwise. The content herein is owned by the blogger. Godrej Food Trends Blogging contest, Fashionablefoodz or Godrej is not responsible for any kind of infringement caused.